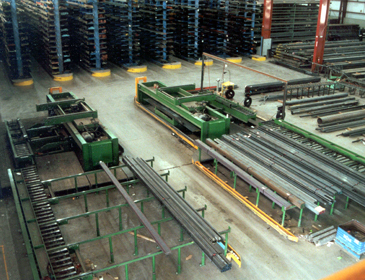 The Braner USA Long Products Bundling System is an automated materials handling system that dramatically reduces the time metal distributors spend filling individual orders for long products (pipe, tubing, round and rectangular bar, and structural shapes) by as much as 75%. The new Braner/Loopco Bundling System mechanizes and automates the handling of heavy long product storage trays, and automates the bundling, strapping, weighing, wrapping, and final staging of the finished package. In addition, the system improves side loader material handling efficiency by reducing time lost waiting to transport storage trays to and from storage racks. 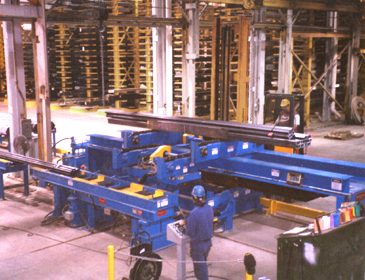 Using a Braner/Loopco Long Products Bundling System, one attendant can fill between 80 to 120 orders per shift, more than three times the orders that one attendant can fill utilizing other methods.